Cities are greatly in need of slimming down their roads, says architect Michael Bohn. A recent project in Long Beach, California shows how curb extensions and street furniture can have a huge impact on the economics of downtowns. Humans are not the only ones needing a diet these days. More and more cities are putting their streets on a diet – reducing vehicle lanes to add pedestrian space and calm traffic. New York City’s recent success in closing an entire section of Times Square to traffic is the most famous example. But the real news is how quickly and effectively it can happen even on a fairly small scale in any city or town. The other news is that, besides the benefits road diets give to pedestrians and business that thrive on foot traffic, in some cases even traffic congestion is – surprise – improved as well. Long Beach, California is implementing a series of road diets that prove just how well they can work. Among these is a project unveiled in late 2009 at First Street and Linden Avenue in the East Village Arts District. Studio One Eleven, my firm, worked with the city to design curb extensions at this intersection. These “bulb-out” extensions of the sidewalk reduce the curb-to-curb distance – originally over 50 feet – between 40 and 60 percent, significantly lowering the exposure pedestrians face with vehicles, bringing them out past the obstructions of parked cars, street trees and street furniture. The narrower right of way on First Street has also calmed traffic, adding to pedestrian and bicycle safety and giving businesses better visibility. Today, these bulb-outs are fully integrated into the street infrastructure, but a prototype plan was able to test the idea temporarily, turning the experiment into a community event. The city placed large, potted plants in the street to define the pedestrian zone. An adjacent restaurant expanded its outdoor seating into this new area of the “sidewalk” (at this point it was actually still part of the street). And an information kiosk was installed to explain the concept of the curb extensions. It is taken for granted among some planners that enhancing pedestrian mobility can also enhance business activity, but the results in this case were dramatic: The restaurant achieved the highest receipt sales in its 10-year history. The new, permanent curb extensions at First Street and Linden Avenue expand the pedestrian realm over 3,000 square feet, the size of two average coffee shops or a medium-sized restaurant. Besides outdoor dining, there is now room for landscaping (using drought-tolerant plants), street furniture such as benches, sidewalk paving patterns, and trash receptacles. Businesses use the expanded sidewalk for additional bike racks and outdoor sales displays. The extra space has cleared existing sidewalk area for thorough movement while expanding and making prominent the outdoor activity at these businesses. 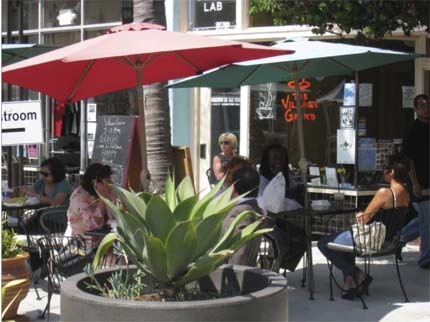 This human-scaled design is perhaps the most important advantage of a well-planned road diet: The First and Linden curb extensions have contributed to the increased vitality of Long Beach’s East Village Arts District, with business owners, customers and local residents enjoying a sense of place that harmonizes with the energetic vibe of retail and community destinations. More than ever, the neighborhood is a civilized place where pedestrians and bicyclists are easy to spot, coffee drinkers can people watch, and shoppers are inclined to linger. But what about the ability of curb extensions to actually facilitate traffic flow? It seems counter-intuitive, as bulb-outs purposefully slow down cars and often eliminate right-turn lanes. Those who advocate traffic diets believe it is more important for pedestrians to cross safely than for cars to get through an intersection. However, the shorter distance that results from curb extensions on each side of a street means the average pedestrian spends at least four seconds less time when crossing the street (based on the Manual on Uniform Traffic Control Devices average walking speed of 4 feet per second). The irony is that the reduced time necessary for walkers to cross the street can provide more time for cars to pass, partially compensating for the loss of a right-turn lane. In other words, everybody wins: Cars get maintained traffic flow and pedestrians get safer crossings. Other road diet plans also carry this double benefit. For example, car lanes can be reduced without necessarily reducing the number of cars they move. To maximize traffic capacity, engineers typically fit as many automobile lanes as possible, leaving a relatively narrow border on each side for sidewalks and (in some cases) on-street parking. This sometimes results in an even number of lanes, eliminating a dedicated left-turn lane. This means there must be restrictions placed on left-turn movement, as the left-most lane must do double duty as a left-turn lane and a throughway lane. Because the shared lane is obstructed whenever a left-turning car is waiting for an opening to cross traffic, left turns are often limited to non-peak hours. When a road diet is applied to a road with at least four lanes overall, it often removes one lane in each direction. The space made available by eliminating these two lanes can be used for creating a dedicated left-turn lane, as well as sidewalks, parkways, bike lanes, or a dedicated right-turn lane. Surprisingly, eliminating one through-lane in each direction does not result in a proportional loss of car-carrying capacity, and the addition of a dedicated left-turn lane (and sometimes a dedicated right-turn lane as well) helps reduce congestion. Adding turn lanes in this manner can also decrease accidents, because it results in fewer lane changes and better visibility for on-coming traffic. All of these benefits are useful in explaining road diets to skeptical traffic engineers, or reluctant business or community members. 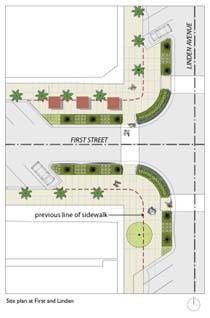 My firm is working with Long Beach to add curb extensions and other road diets throughout the city. These include narrowing streets adding curbside parking and bike lanes, and creating protected bike roadways between car parking and the sidewalk. The addition of curbside parking is important particularly in parking-impacted areas. At a cost of $8-12k per stall when a new surface parking lot is built, curbside parking is almost a freebie. For example, another Long Beach road-diet project (on Livingston Drive) will add 32 parking stalls in a mid-density residential neighborhood, with the only cost for these stalls being paint to restripe the street. From a retail perspective having curbside parking in front of a shop can increase retail sales by thousands of dollars while at the same time serve as a buffer to pedestrians using the sidewalk from moving vehicles. Many of these changes are the result of Long Beach’s Livable Community agenda, which enjoys broad support from Long Beach’s City Council and is a top priority for its city manager. In 2009 the city hired Mobility Coordinator Charlie Gandy – a nationally prominent bicycling proponent – to implement many of these plans. In the instance of the First Street and Linden Avenue curb-extensions and the other road diets underway, that strategy is successful.